Daycare gives you options. Many moms and dads want to return to work but are not sure about Danville daycare options. Give us a call at Learn And Play Montessori and come in to see our best-in-class daycare options, and then you can return to work in peace. You don’t actually need to book a school tour if you don’t want to because we provide school tours Monday to Friday from 9.30 am to 10.30 am and walk-ins are welcome. We’d love to show you around so that you can see what the children are doing and how happy they are, which will put your mind at rest. We do get a lot of questions about the Montessori Method of Danville daycare. (Gosh that sounds complicated!) Dr Maria Montessori believed that the most important years of a child’s education are the first six years. During these years a child’s mind is curious and absorbent and provided he is properly stimulated and nourished he will form patterns of learning which are the foundation for everything that follows. We emphasize learning using all five senses rather than just sitting listening to a teacher talking or reading a book. We have a wide range of materials available in class and the child can choose for himself what he wants to do with them. He can work and play on his own or as part of a group if he chooses. The materials and exercises are designed to stimulate independent exploration, and the teacher will watch each child individually and introduce more materials to him when she knows he is ready to explore further. We have groups which cover a three-year age range and the older children will show the younger ones what they have learned, which underscores and reinforces their own learning. Children learn from one another, which you can readily see in the family environment where the younger sibling will learn from the older one. 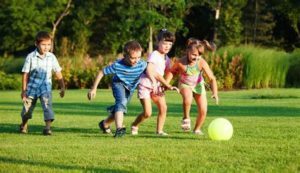 Working and playing in a multi-age group develops social skills as the older children act as a model for the younger ones. This aids the development of co-operation and collaboration and removes any sense of competition because the children are not expected to perform equally and show identical skills. Each child works and plays at his own pace and the slower learner is not hurried, nor is the quicker learner held back. The teacher watches each child and introduces fresh ideas and materials when he is ready. So please come in and look at our Danville daycare on any day that suits you and you can see for yourself how happy the children are, because they have learned to love learning. Then get out and take your kids to one of the beautiful parks in Danville!